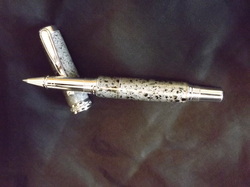 Titanic Coal Pens - David's Pen Handcrafted writing instruments and turnings. The RMS Titanic was a passenger liner that struck an iceberg in the north Atlantic Ocean on her maiden voyage from Southampton, England, to New York City, United States, and sank on 15 April 1912, resulting in the deaths of more than 1500 people in one of the deadliest peacetime maritime disasters in history. R.M.S. Titanic was designed by experienced engineers, and used some of the most advanced technologies available at the time. The fact that it sank on its maiden voyage added to the particularly ironic nature of the tragedy. The 0nly artifact that could legally be sold was the coal that was recovered during a 1994 salvage expedition. These pens was handcrafted using actual coal that was on the Titanic over 100 years ago. The coal was crushed, then it is casted in a clear polyester casting resin. After it set up it was removed from the mold and turned on my lathe.